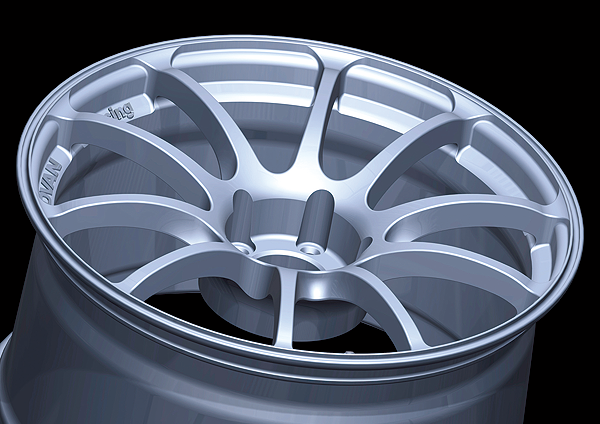 Design must be the most critical aspect of YOKOHAMA wheels. Pride in light weight and high strength means nothing without outstanding design. But with wheels, everything cannot be sacrificed for the sake of design. First of all, the wheel and tyre must clear the fender arch of the car which it is mounted on, and the wheel must provide sufficient clearance for the brake callipers as well. Every inch calls for dynamism to the nth degree. Renderings that fail to reflect the final design are useless. 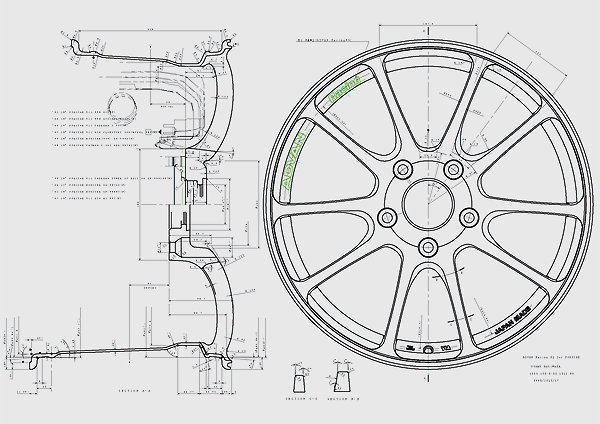 At YOKOHAMA, we start the design process with CAD drawings. We move from CAD drawings to 3D computer graphics to a full-size mock-up. Every detail is scrutinized and every measurement verified until the design is finalised. After that, it is our development policy not to adulterate the design as it is made into a product. Why? Because that allows you to put your hands on exactly the wheel we designed, with all its cool personality. A wheel must pass a set of standard test (JWL) for strength before it is introduced to the market. With new designs, we use 3D computer graphics and computer analysis to determine if the strength meets the relevant standards. Aggressive designs or ones that aim specifically at lighter weight especially must clear this computer analysis step before they are ever created in metal. With the computer analysis as an important tool, we achieve both light weight and strength that meets our standards, without spoiling the leading-edge quality of our designs. It was said that “Casting only gives you rough composition and a lot of cavities,” in the past, but that was a long time ago. Casting methods are constantly evolving and improving at a very rapid pace. There are three important steps in casting aluminium to achieve a tight composition. First, prevent the molten aluminium from coming in contact with external air. Second, pour the molten aluminium quickly and smoothly into the mold. And third, quickly cool down the aluminium in the mold. 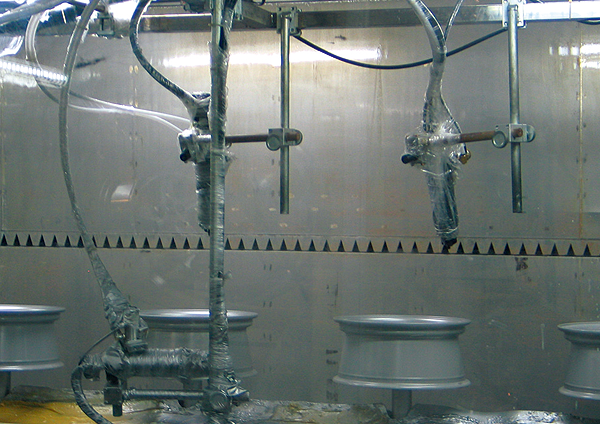 Here’s how YOKOHAMA Wheel’s high-tech casting system works. Aluminium is melted in a furnace at 700°C. The molten aluminium goes down a channel; that is sealed against external air and cleaned up with argon gas; and poured smoothly into a mold set on a slant. 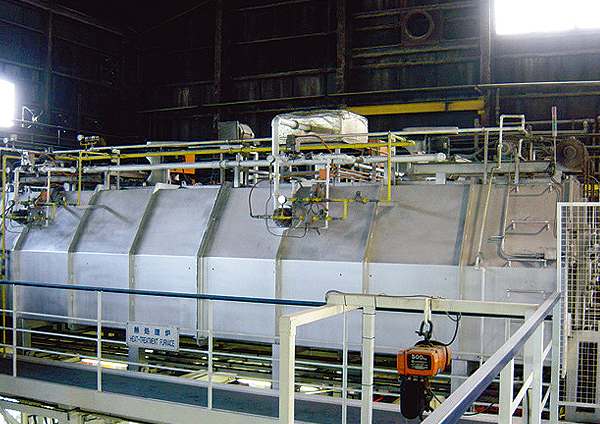 The computer-controlled mold gradually levels as the molten aluminium fills it. This method prevents any air bubbles from remaining in the molten aluminium, and have quick filling enable. Once the filling is complete, coolant is circulated through the mold’s water jacket and quickly cools the casting. 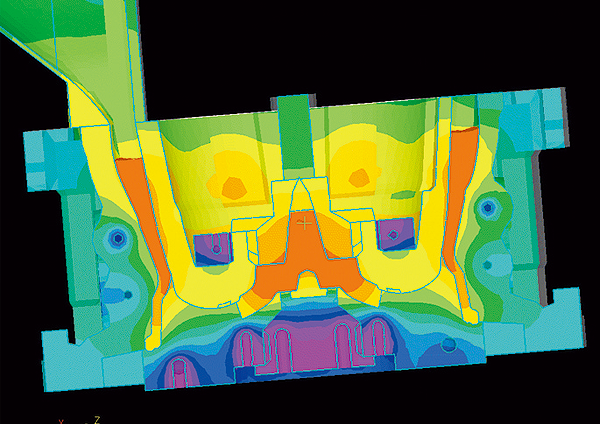 The cooling process is minutely computer controlled so that the temperature of the coolant, the rate of cooling, and the degree of cooling are all kept at the level that ensures the strongest castings. 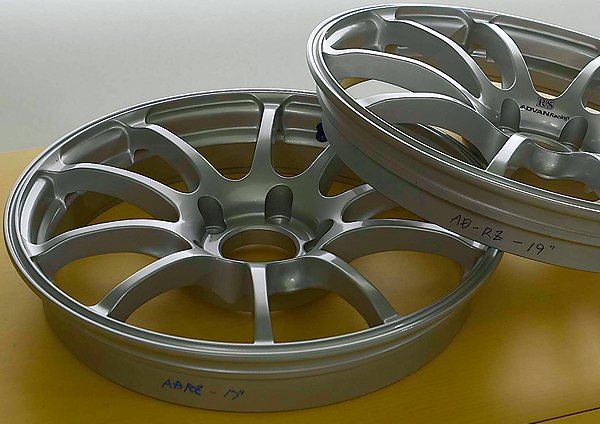 Of course, the superb mechanical properties of aluminium alloy itself are taken into consideration and the best possible combination of metals is used to create the alloy which YOKOHAMA wheels are made of. The combination of all these aspects results in a dense, uniform composition throughout the casting. For the inner rim, YOKOHAMA Wheel uses a flow forming technology that applies pressure to the rim area after the casting is finished, stretching and forming the material. This method causes metal flow similar to that occurring in forging processes, imparting the tensile strength needed in the inner rim area. In the inner rim profile area, designs offer superior shock resistance. Thus these 2 points materialise a huge advantage over conventional cast wheels. 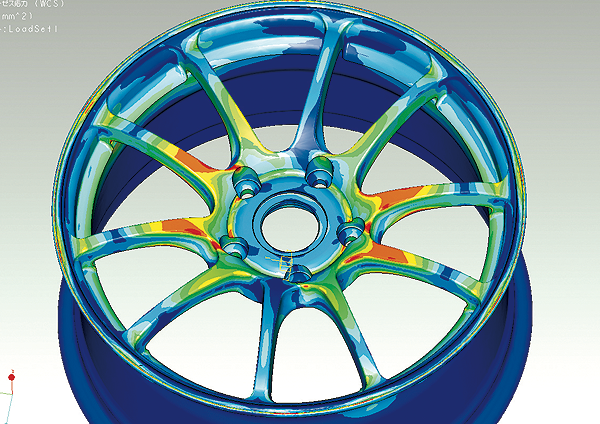 Heat treatment is vital to stabilise such wheel characteristics as strength, rigidity, and elongation. At the same time, it removes stress throughout the wheel and improves the wheel’s roundness and the accuracy of its measurements. 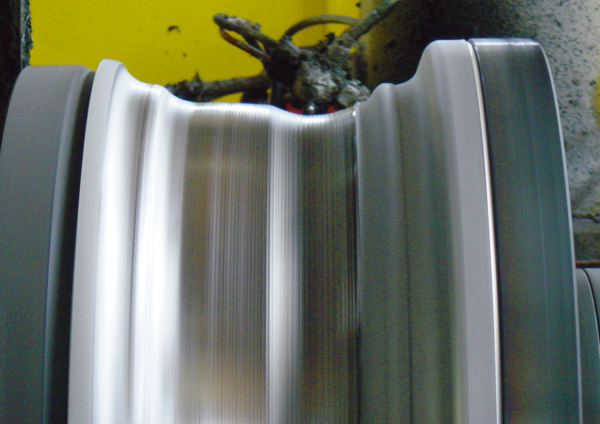 YOKOHAMA first puts its wheels through T6 heat treatment to obtain the physical characteristics we want. Then the wheels go through a special treatment that gives these cast wheels elongation characteristics second to none. 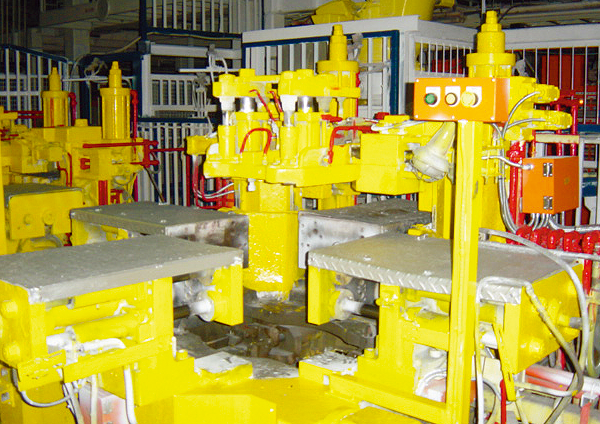 This Special Treatment method would be impossible without the rapid cooling done in the mold during casting. All these steps combine to give YOKOHAMA cast wheels their high-performance characteristics. 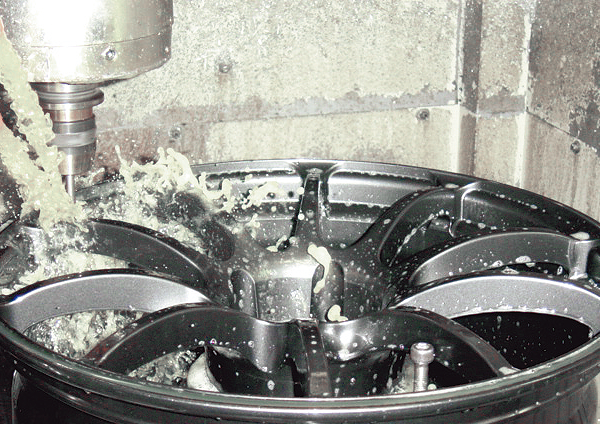 Finishing is the final process that determines the wheel’s appearance. Most YOKOHAMA wheels go through a substrate powder coating + baking + coating + baking + powder clear coating + baking, 3-coat, 3-bake coating process. When we use hyper-type paint, an extra coating and baking process is added. The final step, which gives the finish its superior appearance, uses a special powder paint which has 100 micrometer thick paint film. The special paint is expensive and delicate and must be handled with care, but the powder clear coating results in a very smooth finish. With the ADVAN Racing brand, each wheel is engraved with the brand trademark in a three-dimensional process. Attention to fine details such as these finishing ones spells out the difference in MADE IN JAPAN. At YOKOHAMA Wheel, we have just begun the challenge of producing forged wheels. Our first is the AVS MODEL F7. Forged wheels are stronger than cast ones, but there is some room for improvement in the area of design. At YOKOHAMA, our objective in creating forged wheels is to achieve the same uncompromising design as with our cast wheels. To this end, because there are limits on designs when using the machining process that creates a bucket-like shape from the forged material, we turned to molds, and are creating forged wheels with them. Looking at the MODEL F7, its special characteristic is the full face design in which the face extends all the way to the edge of the rim flange. To achieve that design, YOKOHAMA Wheel uses four molds to create the wheel instead of the usual three. To obtain the tensile strength expected of forged products, the density and the direction of the “metal flow line” which could be called the lifeline of the forging process, is extremely vital. 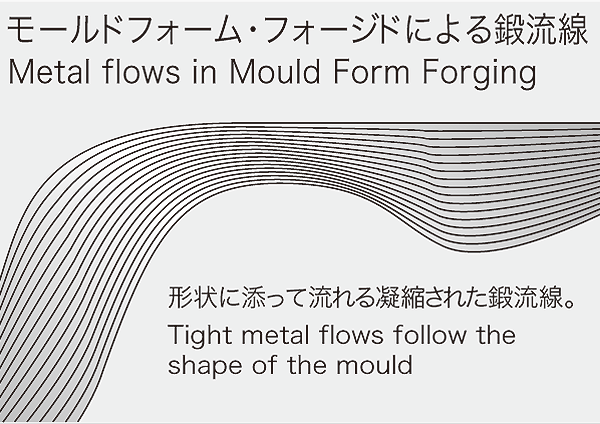 The advantage of mold form forging comes from the ability to control the metal flow according to the design and the rim profile. YOKHAMA forged wheels are made with a four-mould method that controls the metal flow at every point in the process. This is combined with the spin-forging method, which will be explained later, gives the disk higher rigidity and the rim exhibits a higher tensile strength based on its metal flow. And the super-accurate calculations are used when producing the mold. The material used in forged wheels is called “billets” The difference in a cross-section of a finished wheel and that of a billet is called the forging ratio. The larger the forging ratio is, the denser the forge composition is. In pursuit of the highest possible forging ratio, YOKOHAMA Wheel uses a forging machine with an 8,000 ton maximum pressure rating. This high-pressure forging is what made manufacturing of aggressively designed forged wheels possible. In addition, the four-mold final forging process enables the entire wheel to be spun during the rim’s spin-forging process after the design portion has been forged. 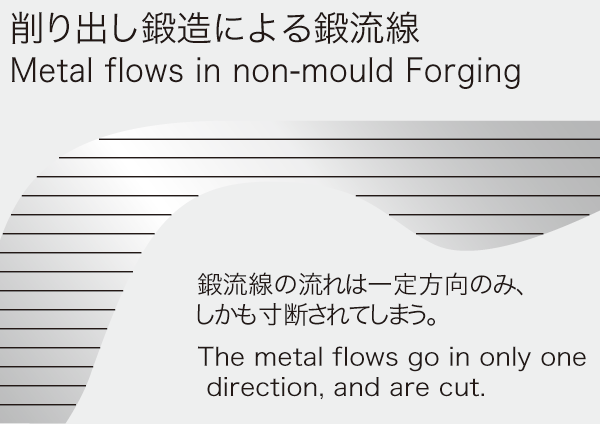 In this way, the metal of the rim spreads out quickly and each component gets the most dense and most ideal metal flow. ２つのＷに挑戦する理由 why challenge both Ws? Among the YOKOHAMA Wheel brands, ADVAN Racing is best- known as a high-performance brand. 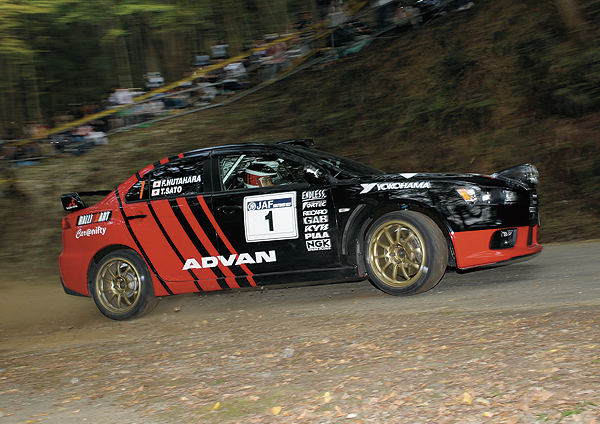 Because of its characteristics, ADVAN Racing wheels continually challenge motor sports in many fields and events. 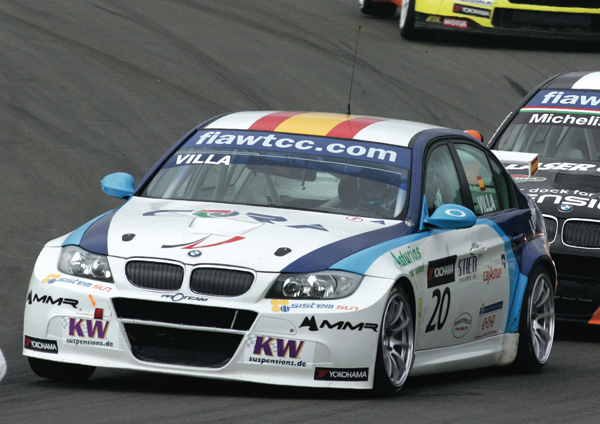 For example, WTCC and PWRC are FIA world championship series. We provide ADVAN Racing RS wheels to Italy's Scuderia Pro Team (WTCC-BMW320Si) and ADVAN Racing RC III wheels to Japan’s TUSK Engineering (PWRC-LANCER EVOX). YOKOHAMA Wheel has one policy in meeting the challenge of motor sports-to provide wheels that feature the same design and finish as normal street wheels. Of course, we listen to feedback from the teams and work to make improvements they need; the know-how we gain from that effort goes directly into the next generation of wheels. In other words, meeting the challenge of motor sports contributes directly to the quality and performance of our wheels. This is a policy that YOKOHAMA Wheel will never change, now or in the future.